If privacy is extremely important for you, and it should be, then you should try the Ultra Surf platform on your Windows 8, or Windows 8.1, 10 based device. Ultra Surf is a great tool that can be used in order to keep your web browsing activity anonymous. In case you want to learn more about this platform and for downloading the latest version of the same, don’t hesitate and check the following lines. The most annoying thing nowadays is that anyone with some advanced internet knowledge can track and register our online activity. So, if you are not paying attention you can end up in losing precious data and you can deal with other risky situations. Therefore, if you are spending most of your time online, browsing and accessing various websites, the best will be to use a dedicated tool that can guarantee full protection and an anonymous state of your account. In that matter you should download Ultra Surf on Windows 10 or Windows 8, 8.1. By using this app no one will know from where you are connecting to the network or who you are. Moreover, Ultra Surf hides your IP address and changes it for another one that has nothing to do with the original one. It also clears your web browsing history and the cookies that are usually stored on your web browser client. So, in a few words, with Ultra Surf you are secured and also anonymous. At the same time, the tool uses strong end-to-end encryption to protect your data transfer from being collected and analyzed by third party entities. The best is that UltraSurf can be easily used on any Windows 10, or Windows 8.1 device. All you have to do is to download the tool on your laptop, tablet or desktop and that’s it. You don’t need to install the program, as it will start once you launch the software. This means that you can easily place it on an USB stick and take it with you without any kinds of problems. 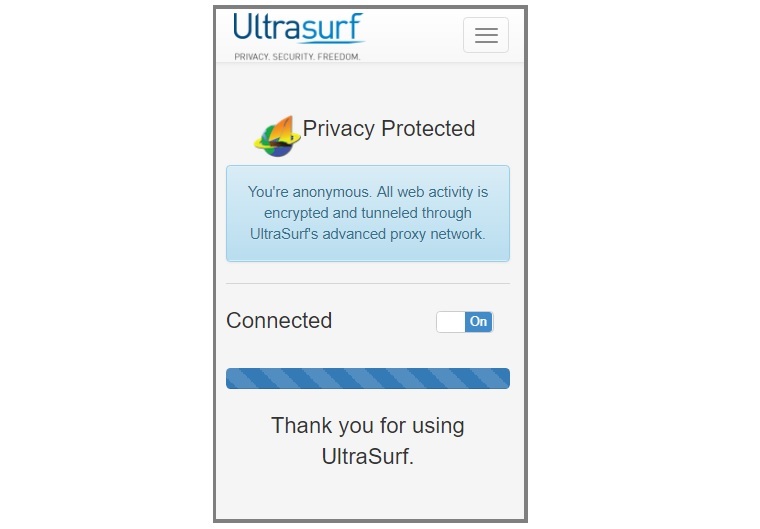 So, UltraSurf is easy to use without installing anything on your device and ensures secured web browsing activity. You can learn more about this tool by accessing its official web page, from where you can also download the latest version of UltraSurf for Windows 10 or Windows 8, 8.1 systems. At the time of writing this article, the latest UltraSurf release is version 17.04. Unfortunately, the official changelog is not available yet, but we’ll update this article accordingly as soon as the information is available. Users confirmed that the software is now faster and more reliable. While Ultrasurf runs smoothly on Microsoft Windows and the default browsers of the OS, you may encounter various issues when using the tool on other browsers. To fix that, you need to manually set up proxy and you should be able to use Ultrasurf without any problems. UltraSurf is also available as a Chrome extension and you can use it on all platforms, Linux included. You can download the UltraSurf Chrome extension from the Chrome Store. Keep in mind that certain antivirus programs may block Ultrasurf from downloading or launching. To fix this issue, add Ultrasurf as an exception, or you can simply disable your antivirus. Turn it back on as soon as you’ve downloaded or launched UltraSurf. UltraSurf is a proxy service, designed to enable users inside countries with heavy Internet censorship to visit any public web sites in the world safely and freely. If you are not located in such a country, you can also use the software to hide your real IP address to protect your privacy. UltraSurf is a standalone application (no installation needed) that automatically configures Internet Explorer to use UltraSurf whenever you run the program and displays a lock icon on the desktop to indicate that anonymous browsing is active. You can also use UltraSurf with Firefox, Chrome or other browsers, however you need to configure the proxy settings manually (localhost:9666) or use the available Firefox add-on tool to do this (in addition to this download). We hope this article helped you find and download the latest UltraSurf version on your computer. If you’ve got additional questions regarding this post, let us know in the comments below.